The fly is intended to imitate the mole crab or sand crab. The use of the gray deer hair with cream spots stacked into the body helps in imitating the sandy color of the crab’s carapace. 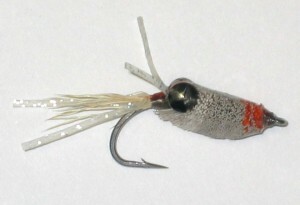 The machined brass eyes are tied under and behind the hook point leaving plenty of room to form the body. The thread shield is placed on the fly to protect the thread wraps that hold the brass eyes to the hook from the ravages of the sand bottom. This material can be purchased from a craft store. The tail (telson) of the crab is left off because it is not one of the obvious characteristics of the crab. If tied in it would tend to hide the roe sac. The roe sac is stacked in at the bottom of the body near the hook eye with gray hair stacked on the top of the fly. This fly obviously is intended to represent the female crab. The mole crab has two sets of antennae. The larger ones are extended by the crab when it is buried in the sand to allow for sensing its environment and for respiration. The second pair is feathery and used for filter feeding. When you pick up one of these crabs the antennae are hidden under two flaps under it head. Tie in a small bunch of tan bleached elk to represent the feathery antennae and two strips of Sili Legs for the longer antennae. Loop the Sili Legs to form the longer antennae and later cut the loop to form two legs. After all the spinning and stacking are done trim the hair to an olive shape. The body should be slightly pointed toward the hook bend to form the rostrum of the carapace. The most important part of tying this fly is to pack the hair as hard as possible. The finished body should be as hard as cork. Thin some Softtex with toluene or xylene and apply a very small amount to the top of the body with a bodkin to help with its durability. Do NOT soak the hair with this stuff. I can triple the weight of the fly making it very uncomfortable to cast. To finish the fly coat exposed thread and the bottom of the body a thin layer of 30-minute epoxy.